A project for the new vehicle with sloped armor plates and components of the Pz.Kpfw. III and Pz.Kpfw. IV was approved on January 4, 1944. In March 1944, a contract for three prototypes was signed, but the program was discontinued on July 12. Only a tank destroyer on a similar base saw mass production. 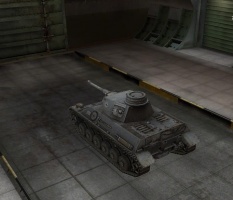 Fast, agile and properly armored, the Pz.Kpfw. III/IV can cover the flanks of heavier tanks, as well as defend terrain from a distance. Its fast speed allows it react to cover critical points of the map and stay ahead ahead of its allies as a spotter. However, it doesn't pay to go solo, as this tank lacks in alpha damage, so it can't actually push through the enemy advance: it is best played like a flanker and scout for the bigger guns. On the plus side, your mobility allows you to duck into cover, poke out of it, and finally get around it. This repositioning allows you to dodge fire directed at your weak turret armor, while you shoot at them from behind with your adequatly accurate 75mm gun. It is a remarkable defensive vehicle, but due to its offensive weaknesses it can't be relied upon to win a tier 5 match all by itself. Gun penetration vastly more reliable for picking off enemies, compared to the weaker 50mm L/60 at tier IV. As in the page introduction, the Pz.Kpfw. 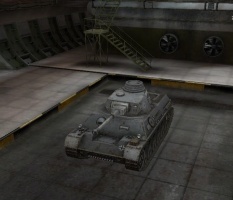 III/IV is a somewhat unique tier 5 tank. It's somewhere between a flanker and a half-scout, combining high mobility, good acceleration, agility, and fairly powerful hull armor at the price of some glaring weaknesses. Notably these are mediocre accuracy, poor armor on hull sides and turret, also somewhat lacking alpha damage giving it a limited offensive capability. In terms of tactics, use the mobility to position yourself in vital spots in the map, such as cap points and on your enemies flanks, as long as you stay far back enough to be in cover with an escape route. Try to react and defend from cover or strike accurately from afar, rather than charging in and going on the offensive. Firstly, mobility. first played with all modules stock you may be disappointed by its sloppy movement as it's a far cry from your Pz.Kpfw. III, but with a ridiculously strong top engine and upgraded suspension you will be able to outrun almost all non-scout tanks you will face. The best use for the high speed is popping around ridgelines, spotting the enemy for heavier guns and earn a few snap shots by yourself. 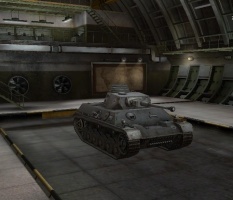 Agility is excellent and well suited for cicling, with unrivalled turret traverse speed, though it never hurts being vigilant of enemy reinforcements possibly planning to outflank you. In terms of survivability, 80mm of sloped upper glacis armor is directly superior to 70mm on the PzKpfw III, though also facing opponents with bigger guns. The lower parts and sides left much to be desired, barely improved at 60mm and 30mm respectively. Size wise, the tank is rather tall and has mediocre camouflage. If you can add your own angling into the mix, you might get a Steel Wall achievement by luck. Also note that a large portion of your hull side is not covered by spaced armor, so one hit from 105 mm howitzer there will probably cripple you. The gun is one of the most notable issues of Pz.Kpwf. III/IV. It can't mount a 105 mm howitzer like Pz.Kpfw. IV or M4 Sherman, and 7,5cms' are not really impressive, with mediocre accuracy, penetration and acceptable RoF. If you are putting it to use, better avoid long-range engagements for preservance of ammunition. Usually if you utilize your assets right, you will still come out on top of duels (ie due to the armour and agility). In a solo engagement, peek around corners with angled armor, and get up close and personal and force them to rotate helplessly in place and abuse their slower reload. It is advised to go for the suspension before anything else, because the stock one has pitiful traverse speed and terrain resistance even with top engine mounted. Be aware that the upgraded gun has marginal amounts of penetration and accuracy over the stock gun, and isn't necessarily the first choice for research. Additionally, the turret gives you a good bit of health, so this will increase your overall survivability and will also probably be more useful than going straight for the gun. Crew skills are advised to focus on maximising the already outstanding mobility, as well as compensating the mediocre spotting capability and firepower efficiency. The loader who cannot help with that can take Safe Stowage to prevent ammo rack damage from weak sides (or repairs if you tend not to take large hits). 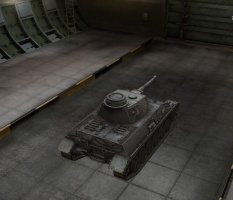 GLD, Optics, and Gun Rammer are good equipment to help those two traits respectively - the optics especially is a must for the next tank, the VK 3001D. Getting the suspension is very important for this tank. Now you have the weight capacity to upgrade everything else. The high power of HL 157P engine brings out this tank's true potential. Upgrading the turret not only gives a small boost to gun stats and view range, but also grants additional hitpoints and armor screen around the turret. This page was last modified on 12 January 2018, at 08:32.